I don’t usually post memes either here or on our Facebook. There’s a glut of them there already. And I get frustrated with the Facebook platform because of it; it’s become a ghetto for short attention spans. There’s still some thoughtful convos going on there, but there’s also a lot of people just throwing memes at each other. Can’t blame people though, I have a short attention span when I’m overworked, too. And America is overworked. It’s also a pretty good attention-getter for what its creators, the New Jersey Organizing Project, want to remind us about. In 29 days is the 3-year anniversary of Hurricane Sandy. Whole neighborhoods in New Jersey were devastated. Our governor – and his fleece – were everywhere then; hugging survivors, surveying damage and making promises he’d make sure things would be taken care of. A lot of national TV cameras followed him around. And he sure did look heroic. And he sure saw his stock rise as the nation’s governor. But 3 years later, as NJOP makes clear, people are still dealing with fraudulent contractors, banks trying to foreclosure on damaged properties, and problems getting enough help with temporary housing. People are hurting – still. It’s one thing when a governor splits his time between home-state duties and a campaign for the White House. But usually, that’s successful governors who have something credible to sell. 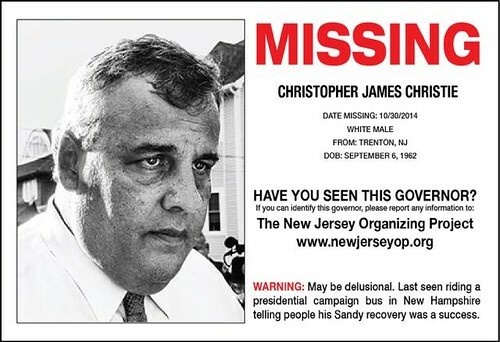 This governor’s mismanaged his state in many ways, leaving job creation problems, a Transportation Trust Fund nearly out of gas with project piling up, an affordable housing stalemate that Christie policies are responsible for and more. But it may be worst for the thousands of Sandy families who still can’t go home. And that’s particularly offensive, given: (1) the mileage Christie got using Sandy relief funds for Stronger than the Storm TV ads promoting himself during his reelection campaign (2) the fact our inattentive governor has not come through for Sandy families and (3) has been out of state more than half this year bragging to people in other states like he still thinks he’s the hero of Hurricane Sandy. So, if you know anybody in New Hampshire, shoot this meme up to them. Or better yet to Iowa, where he was yesterday trying to restart his flagging campaign. While you’re ay it, ask those folks if Christie’s the one they really want running the country during Iowa’s tornado season. Follow New Jersey Organizing Project – on Facebook & Twitter.